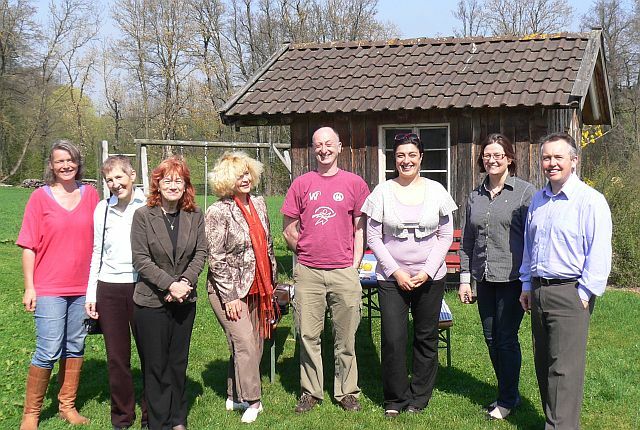 A week ago we experienced Bavarian hospitality at its best in guesthouse Zehmerhof where Ingrid and her family looked after our project meeting from the 6th to 8th April 2011. We were treated to two beautiful days weather and our hosts organised lunch in the garden on both days which helped us all to concentrate on our project. Our host Mrs Ingrid Eisenmann provided us with a presentation on how their 9 hectare family farm developed since 1973 in to a 25 room guesthouse & apartments today. Mrs Eisenmann married in to the family farm business in 1996 and came from a background of working in the financial sector. The majority of employees are members of the farm family and Mr. Eisenmann farms a poultry unit with 8,000 chickens. In 2003 they built the apartments for self-catering guest accommodation and to their dissappointment visitor numbers was low. In 2008, the local Therme was built near Erding which brought a new type of tourist to the area who required accommodation for shorter stays (the Therme is one of Europes largest water based spa facilities which caters for all the family). The family then experienced an increase in demand for accommodation with breakfast and their self-catering apartments. They upgraded and expanded their reception area to make their accommodation more comfortable for their guests. 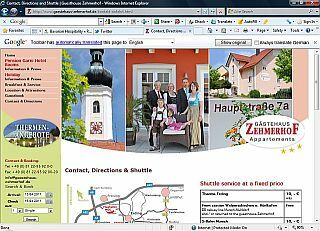 In order to increase their guest numbers further they developed their website and began offering packages which included entrance tickets for the Therme. Since then their business has taken off and they are happy with their income from the tourism enterprise. I will not forget the friendliness of our host and the high standards of their accommodation & food. Partnership agrees that sunshine has helped project to progress! Personally for me, this was perhaps one of the most enjoyable meetings of our project todate. All the remaining tasks for our project have fallen in to place through the dedication and hard work of all the partners equally. Our partners from Babes-Bolyai clarified that their accreditation has been officially approved and how they are preparing to deliver the course next autumn. Dr. Anja Hensel-Lieberth from the State Leadership Academy for Nutrition, Agriculture and Forestry provided an insightful presentation on how our project syllabus has been adapted for delivery on a pilot basis. This course will be presented to a working group who have been working on Europes first Certificate for European Consultants in Rural Areas (CECRA). This was followed by a presentation by Mr. Wein a colleague of Dr. Hensel-Lieberth and also a senior member of the International Academy of Rural Advisors (IALB) who have been instrumental in developing CECRA. He clearly highlighted the main objective of CECRA as being the development of a standardised training for agriculture advisors and related stakeholders throughout Europe. Our project partners received these presentations enthusiastically and we are going to explore opportunities for the implementation of our train the trainer programme in rural entrepreneurship through CECRA and IALB. 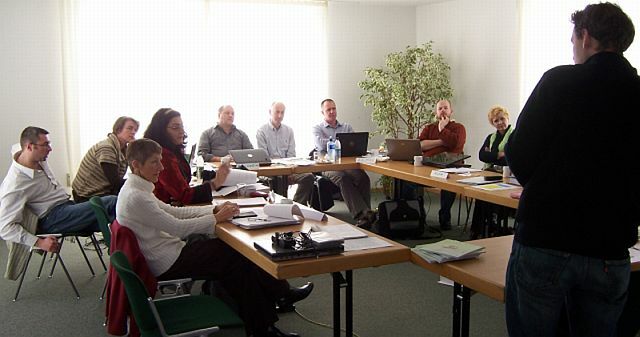 In addition, we are organising a meeting to bring together a number of key European stakeholders in the fields of rural tourism / entrepreneurship, certification and agriculture advisory to a meeting on the 27th May 2011 in the Netherlands. We have developed a worthwhile training programme and are interested in hearing from organisations that we can collaborate with in the future. I will add more details about our plans in the coming days and we welcome your feedback. 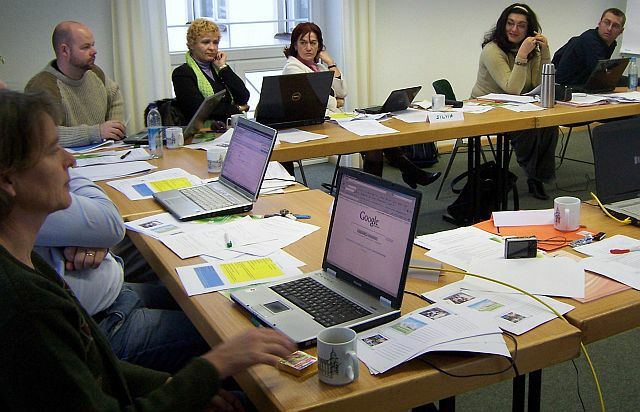 Our project had its third partners meeting on the 26th and 27th January 2010 in Freising, Munich, Germany. Our meeting was hosted by our colleagues from the Bavarian State Research Centre of Agriculture and the meeting was held in the most wonderful setting of Kardinal-Dopfner-Haus in the town of Freising. Our Bavarian colleagues provided us with an insight in to the operations of the Bavarian State Research Center of Agriculture and how their training systems are implimented. Their Director Dr. Viktoria Lofner-Meir presented an overview of the Research Centers work on the first day of our meeting. This was complimented by a workshop facilitated by Mr. Pablo Asensio the following day on how the ‘train the trainer’ course could be intergrated into their training systems. Now I have your attention! It is a rewarding experience to work on a Leonardo project and step outside of your normal comfort zone to work with colleagues on a EU wide basis. The project has jumped forward with a more defined timeframe of what will be achieved by certain dates thoughout 2010. Alot of work was undertaken by each of the partners since our last meeting with a view to seeking accreditation for our train the trainers programme. Each of the partners filled in the gaps in respect of how the accreditation system for vocational education training is managed in their countries. Athlone Institute of Technology led the majority of the interactions at this meeting and focussed all partners on the agreement of Irish accreditation template. Indepth discussions on this topic issued and a rough draft was agreed. It was clear that this accreditation template was a work in progress document and further input will be required from all partners before the end of March 2010. Our aim for May 2010 is to have our train the trainers course gain accreditation through the Higher Education & Training Awards Council in Ireland. This will require significant effort from all partners and we are confident of achiving this aim. As the lead partner, I was looking for ways to improve our partners communication and maintain an up-to-date record of all partners contributions to our work in progress. Thanks to Sean Connell from AIT we have brought all partners in to the 21st century through Google.docs. His workshop which was held during our meeting was a challenge, espeicially as the google default kept bringing some of us to the German version. Everybody enjoyed it and found it worthwhile. Its just a case of getting everyone to use it now. Clear timeframes for delivery of our project aims have been established by 3 of the possible 4 partners involved in seeking accreditation. In summary, the project is progressing at a pace which is much faster than I would have envisaged after the first meeting held last October!